Forget about the seventh-generation iPhone. Forget about the rumored Retina iPad mini and forget about the potential for any so-called "iPad killers" that may stem from the next-generation of tablet devices released by Google and their partners. If the speculation is to be believed, the next consumer technology battle could be fought by companies who are prepared to hit the market with some kind of advanced wearable technology. Google has already thrown their hat into the ring with the Glass project and it looks like Apple could be next if the iOS-powered iWatch becomes reality, but where would consumer allegiance lie? Joy of Tech are pretty well known for taking important aspects of the technology industry and poking fun at them through the creation of unique and humorous comic strips. The issue of wearable technology is no different with issue 2316 focusing entirely on the potential of a Google Glass versus Apple iWatch showdown. Let’s be honest, at this moment in time it isn’t a very realistic comparison to make considering Google’s Glass project has actually already come to fruition while the reported iWatch is still just a myth. Still, the potential marketplace battle of the two products does make interesting mind fodder. Glasses and watches are both commonplace in modern society, which is yet another part of the equation that makes both products extremely interesting. While the comic pokes fun at the iWatch claiming that the 1980’s "want their slap bracelet back", the bottom line is that wrist based intelligent devices are all the rage in the technology industry at the moment. The emergence of the Pebble and MetaWatch products that connect to smartphone devices and come with SDKs has managed to capture the imagination of the public, making this type of tech cool. Google’s Glass project has also managed to cause significant stir with those technology lovers who are constantly looking to get on-board with the next-generation of consumer tech. 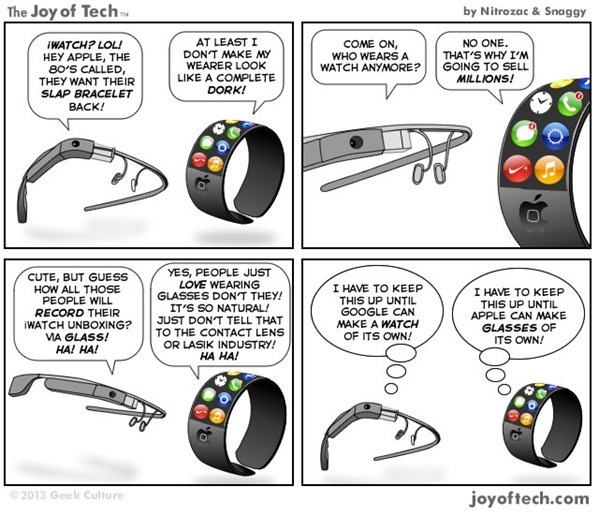 The features and functionality within the Glass hardware is truly exciting, but the Joy of Tech comic does pose some interesting questions about how natural the product will feel, albeit in an extremely humorous manner. It’s unlikely that the two pieces of kit will come directly head-to-head due to their nature, but if the Apple iWatch does eventually hit the market would you hand over your cash to Apple or Google?